There were 6 New and two Updated Academic Core Titles released in October 2014. There are now 667 titles in the Academic Core collection; you can see a full title list in your Admin account (log-in required) or check it out on our corporate site. American Constitutional Law provides a comprehensive account of the nations defining document. Based on the premise that the study of the Constitution and constitutional law is of fundamental importance to understanding the principles, prospects, and problems of America, this text puts current events in terms of what those who initially drafted and ratified the Constitution sought to accomplish. This timely book addresses the implications of this trend, revealing human rights inequities from nation to nation and the consequences of these inequities worldwide. Inspired by the United Nations' Universal Declaration of Human Rights, Andrew Fagan considers the nature of the state, national identity, and citizenship. 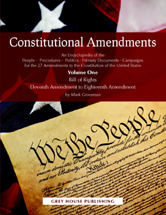 This thought-provoking and interesting text provides a complete examination of each of the United States' 27 Constitutional Amendments. From the prohibition of alcoholic beverages, to slavery, to the voting rights of women, this text illustrates how the US Constitution has changed since its ratification in 1789. Extensive A-Z entries provide coverage of key court decisions, case studies, concepts, individuals, religious groups, organizations, and agencies shaping religion and law in today's society. This beautifully written narrative history paints a magnificent picture of the second largest nation on earth. Key Concepts in Palliative Care provides just this in a compact, fifty-concept guide to the field. Taking account of the government's "End of Life Care Strategy", contributors set out the key issues affecting practice across a range of health and social care contexts. The Encyclopedia of the Solar System, third edition includes fifty-seven chapters from over seventy five eminent authors who review fundamental topics as well as new models, theories, and discussions, making this the definitive solar system reference. This record of Australian English features headwords with subsidiary headwords, definitions, and encyclopedic entries for people and places.